No longer will the wider European rugby community think Barry Daly is a Welsh newspaper. Of course I'm not trying to suggest I came up with that joke...in actual fact I first heard it many many moons ago in reference to former Republic Of Ireland soccer player Gerry Daly [naturally the 'newspaper' was German]. But I still felt it needed to be worked in to the writeup somehow and rather than wait until later when I describe his brilliantly finished try, instead I'll use it...'early doors'. Boy, do I hate that phrase. Could just be my least favourite pundits' cliché of the lot, and that's up against a lot of strong competition. It even grates more than actual bonehead ones like incorrect usage of the word 'literally'. I'm not saying it's a rational hatred, nor am I expecting you to agree with me, I'm just saying it does my head in [though not literally]. So why use it as my title and in all of my subheadings? Well, partly so I could go on the above mini-rant but also because it at least draws attention to the themes I want to highlight from the match. This is a minor point so I'll get it out of the way. There's no use moaning about these lunchtime kickoffs because we're at the mercy of the telly companies and they're unlikely to change them. Bit of a pain to have them two weeks in a row, mind you...anyway, fans need to be mindful of traffic around D4 when the match starts at 1pm on a Saturday. I left with a view to arriving 45m early and ended up in my seat just as the teams took to the pitch. 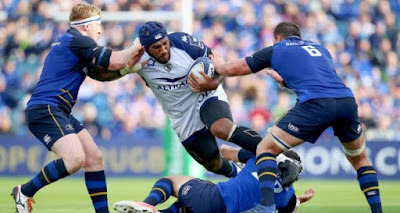 All Leinster fans who watched this match live came away with a profound sense of relief as the Top 14 outfit came very close to snatching at least a draw towards the end, especially when Nagusa chose to run into two tacklers rather than ship it to his wide open team mate. But does that necessarily mean we were lucky? Well if the answer is yes, we had at very least earned the luck. With all due respect to Noel Reid, it was his name on our team sheet that worried me the most. In my preview I pointed out that our 21-23 positions on the bench didn't look like they'd bring much impact if required, especially when compared to Montpellier's and this was borne out in those nervy closing stages...Nagusa's butchery aside there were many quality contributions from him, Pallaugue and Michel. So going into the match, given we were not only far from our ideal lineup but also we needed to protect the very real possibility of Isa leaving the field early, it was imperative that we developed an early lead that we could defend, and after half an hour the job was done as we enjoyed a crucial twelve point cushion thanks mostly to our approach - full credit for this must go to the coaches IMO. First, we seemed to be borrowing a tactic from Munster's European semifinal last season, only while it backfired for them as Billy V refused to be taken out of the contest, here it involved the much more one-dimensional Nemani Nadolo. Pretty much all of our box kicks were aimed at him, and while that may sound odd at first, I think it makes perfect sense. Look - these strong-running powerhouses are going to hurt you, that's a given. Your opposition has several plays designed to do just that and you need to be ready to deal with them as best as you can. On several occasions, like both the visitors' tries especially, we couldn't cope with his power. But when your plan is to kick the ball back to the opposition anyway, what's the best way to minimise his impact? Make him catch the ball thus slowing his momentum and ensure you have chasers to not only delay him further but also to keep him out of the next few phases while your team regroups. This plan together with the tough tackling we've come to expect from Leinster [led by, as usual, our back row with 40 tackles between Messrs Conan & van der Flier] meant that Montpellier had a duck egg on the scoreboard for a whopping 38 minutes. But of course that was only half the battle, and after surviving a lengthy siege from the opening kickoff, we managed tries on our first two visits to their 22 thanks to first a strong miss pass from Ross Byrne and a blistering finish from Carbery, then a fine team effort with strong running from both Adam and Ross Byrne as well as Isa before van der Flier grazed a blade or two of try line grass. And going back to that final scramble towards the end...was Adam Byrne's knockon a penalty try? I have to say I thought so on first look but with replays, it would have been extremely harsh as there was quite a bit of cover. Many criticised Wayne Barnes afterwards but I thought he was quiet by his standards though that view might have been different had Leinster not won with a try bonus! Even considering the way so many youngsters have been fast tracked into the first team under Leo Cullen, this was very much a makeshift lineup for our opening match of a European campaign and with some making their competition debuts we were relying heavily on others who were far from seasoned veterans themselves. Yet look how they performed...two specific examples spring to mind. First and foremost there was that absolutely amazing sequence from man of the match Robbie Henshaw, where he paid back the good luck from his own try [ably, if unwittingly, assisted by Tomane and Nadolo] and then some. On this occasion our young Lion showed an immense amount of mental preparedness after failing to grab the monstrous Fijian winger at the first attempt, reverting to full beast mode in not only getting his man eventually but then legally ripping the ball from Ruan Pienaar to defuse an extremely precarious situation for Leinster. Then there was Barry Daly's finish as he secured the all important bonus point. In the YouTube clip below, skip to 1:24:00 and watch the replay from behind the dead ball line. When he receives the ball, his instinct could be to sprint directly for the corner as Carbery had done earlier...instead he has the composure to realise he's up against two tacklers and thus he cuts his run inside to anticipate the contact leaving himself room to dot down. Heads up rugby that I'd be harping on if he had 50 prior European appearances, let alone none. Another who did well was James Ryan, under trying circumstances too, as while I'm sure he knew he was starting instead of Scott Fardy long before we did, it was still a big stage for him...though having played in a World Under-20 final as well as winning an Ireland cap before his first Leinster one, he is getting used to swimming at the deep end. I get the feeling that Leinster's Pool 3 could be one of those which has all four sides locked on one win after the opening two rounds. Not that we've no chance in Glasgow next week mind you, it's just we can definitely expect a reaction from both they and Montpellier as they return home after opening disappointments. And remember - our pool schedule has at its end this very same French side - we certainly won't want to travel over there chasing too many match points, which means every one we can muster is vital, and while everything wasn't perfect about our display [top of my list would be our decision-making like Luke McGrath's quick tap penalty in his own half when we were 12-0 ahead] we certainly can't grumble about five in round one. Even if time can't help lighten the load of our injury list, the coaching staff have shown they can make really good use of the resources at hand. It's a pool that's tough for sure, but not just for us by a long shot. PS Axel Foley RIP - can't believe it has already been a year.